Friday May 26, Team Dark Side was on location at Seaman Stadium in Okotoks as part of the Field Of Dreams - First Annual Charity Classic. The baseball tournament featured players and alumni from the Calgary Stampeders, the Calgary Flames and the Okotoks Dawgs battling one another on the field! Huge kudos go out to 0007 event organizers/superstars Jeff Wilkie, Angie Shilliday, Jennifer Cockton and Rob Laird for creating a fun, community atmosphere while raise awareness and funds for 2 incredible charities: Life Choice Dynamics and Canadian Centre for Male Survivors of Child Sexual Abuse (CC4MS). The Dark Side Racing Top Fuel Dragster is available for Fire Up event bookings. Our Fire Up displays are incredible face-to-face marketing events because each attendee is a potential customer waiting to be captured. Displays provide cost-effective networking and advertising opportunities. A well-rounded display experience can leave a positive impression for months. We are accessible, convenient and interactive and we recognize that the most important connection is the connection between your brand and your target markets. We are the conduit through which you connect with your target market. That connection is what we call "The Dark Side Experience". By utilizing our unique brand of Top Fuel motorsport marketing, Dark Side works with sponsors and clients to develop and incorporate highly effective VIP and “bucket list” experiences including festivals and customer appreciation events, displays and bbq’s, trade shows, press events, and team building exercises (just to name a few). We transform routine corporate events into memorable experiences for your customers, clients and employees. Dark Side Racing is known for tackling the impossible and making things happen. Drag strips are endless summer fun with the grandkids! Grandkids are one of the greatest gifts of aging. But it's a new world out there and figuring out ways to spend quality time with the little one's can be more than just a little perplexing. How in the world do we get them away from those darn screens without becoming the object of their wrath and resentment? I have a suggestion: This summer, take your grandkids to the drag races! A dragstrip is a playground on steroids. The sights, the sounds and the smells envelope your senses; the energy at a racetrack is palpable. Racetracks stimulate curiosity and creative thinking and they impart a healthy competitive attitude in children and adults alike. Childhood dreams are imagined at the dragstrip and passions ignited. And for the truly inspired, those childhood dreams may one day take shape and become reality. Who knows, your granddaughter might just be the next Shirley Muldowney! Drag racing has always been known as family sport and back in the early 1990's a fellow by the name of Vince Napp decided it was time to get the kids more invested. Napp created an entirely new style of dragster; a scaled down version of the king of the sport - the Top Fuel Dragster. He called his creation a Junior Dragster and I guarantee your grandkids will think a Junior Dragster is the coolest racecar they’ve ever seen. After all, it's a race car built just for them. How cool is that! Junior dragsters have a wheelbase between 90-150 inches and a single cylinder five brake horsepower Briggs & Stratton engine. In other words… a lawnmower engine. The starting price of a new "basic" junior dragster is approx $5,000 but you don’t have to buy new - there is no shortage of used Junior Dragsters on the market that can be purchased for a fraction of the cost. Safety is always of paramount importance and our sanctioning bodies have strict safety requirements. The driver must have an approved helmet, jacket, neck collar, and gloves. All drivers must also wear long pants and arm restraints while behind the wheel of their Jr. Dragster. These items will cost about $500. What's really awesome: The minimum age for competition is only 8 years old. Get them started young and you have years of summer fun to look forward to. My husband turns 60 this month. Yes, it's a milestone birthday for David: The big SIX-0. For David's 60th birthday celebration he'll be doing exactly what he loves – drag racing! This summer, at the age of 60, David will be Canada's sole “Top Fuel” representative at the IHRA Rocky Mountain Nationals. The Rocky Mountain Nationals is hosted at Edmonton's Castrol Raceway and is the largest and most prestigious drag racing event in Canada. David is competing in the professional “Top Fuel” category which is the very pinnacle of the sport of drag racing. The Do it for Dads Walk Run 5KM is a fun, family-friendly event, hosted on Father’s Day, that raises awareness and funds for the leading cancer affecting Canadian men and the families that love them. Registration: $35 or fundraise $125 and waive your registration fee. Your donor dollars are having an impact on research that has the greatest potential to improve prostate cancer prevention, diagnosis and treatment to ensure a better quality of life for survivors. Dark Side Racing competing at 2015 IHRA Rocky Mountain Nationals! The 2015 Season just exploded and that's a very good thing in the world of Dark Side Racing Team Sponsorship! Dark Side Racing has been invited to attend IHRA's 2015 Rocky Mountain Nationals being hosted July 17,18 and 19 at Edmonton's Castrol Raceway. Dark Side Racing will be headlining the event with our fellow Top Fuel competitors Jenna Haddock, Terry McMillan and Bruce Litton. Dark Side Racing was on display March 28 at the Grey Eagle Casino as part of PROSTAID Calgary's Cancer Survivorship Symposium. Invitations were extended to men and women dealing with cancer, regardless of the type of cancer as well as to leaders of cancer support groups from across Canada. A capacity crowd gathered in The Grey Eagle Tsuu T'ina Ballroom to hear from the expert panel of cancer specialists and researchers assembled by PROSTAID Calgary: Mark Moyad, M.D., MPH; John Lewis, PhD; John Oliffe, PhD; and Nicole Culos-Reed, PhD. Calgary's 49th Annual World of Wheels is a wrap and Dark Side Racing would like to thank Bill Knecht and his entire event crew for putting on yet another fabulous Show. Dark Side Racing launched our Lift King Raffle Fundraiser in support of PROSTAID Calgary at the World of Wheels and we want to thank all of the wonderful fans and spectators who visited our booth. Calgary, you demonstrated the power of community spirit and exceeded our expectations. You purchased almost 300 Raffle Tickets over the course of the 3 day event! We are grateful for your generosity and pleased to report that we are well on our way to an incredibly successful 2015 Fundraising Campaign in support of PROSTAID Calgary. 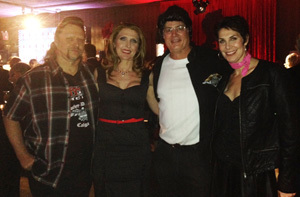 On Friday January 30, 2015 David and Kelly joined friends Steve and Tamara Belway (Steve is the President of PROSTAID Calgary) to attend the Bill Brooks "Rockabilly" Prostate Cancer Benefit. It was without a doubt the hottest social event of the season! The "Rockabilly Theme" inspired some truly epic costumes; Calgary's philanthropy scene did not disappoint! From Web Design to Virus Removal, Dark Side provides complete technical assistance and support to small businesses, home-based businesses, and home users.